The Beautiful Games | What's new? A simple way to see recent changes. Not totally accurate or up to date! The complete coin set in display case - the first of the petrol coin collectable sets. After more than ten years searching i've got Flik-Shot! A massive thank you to 'Ron' for providing me with a couple of copies of this game - something I've been looking for for almost twenty years. 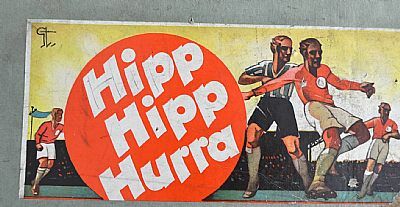 Interesting old game, looks to be 1950s and similar to Tipp Kick and Hipp Hipp Hurra. 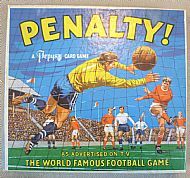 A classic 1950s grid pitch and figures game, beautiful design. Look like pen toppers but no holes! Lovely set of 15 players. 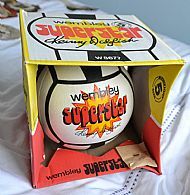 A cracking boxed football from 1978 with original adapter. 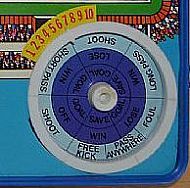 Cracking game based on darts, old, interesting and also contains a rubbish rugby variant game too! Sometimes it is the simple things that please, a printed sheet intended to be used as a pattern to cut out around on plywood sheets using hand tools. Magical. Complete original magazine with unused insert also available. Large wooden game that was the forerunner of the famous Ideal Crossfire shooting game, great design. Superb 1950s metal cast toy with spring loaded shooting action. Cracking board game with great team group. 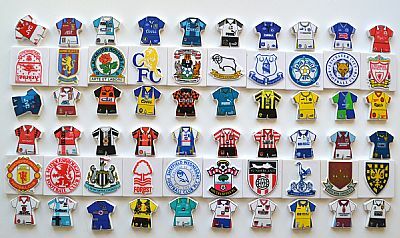 A cracking set of collectable magnets from 1996 complete and stunning. After thirty years of searching I finally find the display stand, happy days! 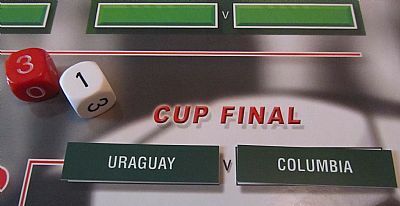 Lovely game full of team cards, draw sheets and dice enabling you to conduct a full world cup - Uraguay and Columbia made it to the final of the world cup of spelling! 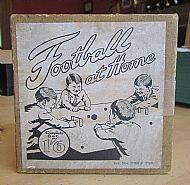 A stunningly original game with wooden players, looks homemade but was produced for retail sale. Very similar to Tipp Kick but made to a very high standard in wood. 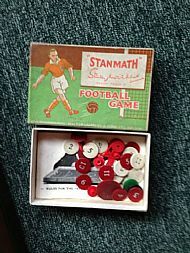 What a find, this magnificent old game is beautifully made and there is absolutely no mention of it to be found anywhere online - do you know anything about it? 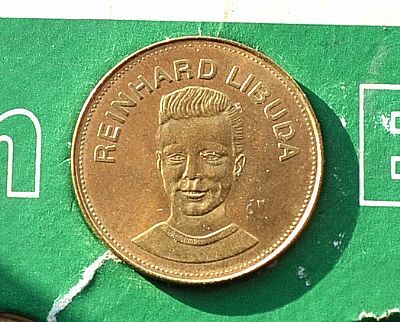 Reinhard Libuda - What's special about this coin? 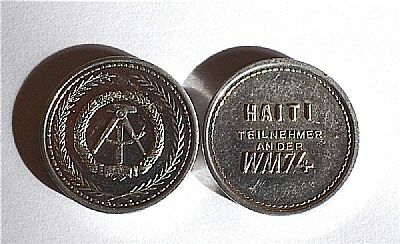 This coin is one issued as part of the 1969 Traum Elf set by Shell in Germany. All four different sets of the classic Pepy's card game are available to buy. I have six of these recent re-releases of the classic TAF 4-2-4 football games. Complete with VHS video. 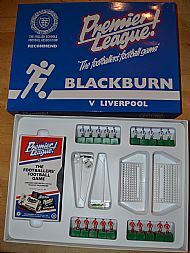 Each ones takes a classic derby rivalry - except oddly Blackburn v Liverpool when Liverpool v Everton is also available. A superb collectable set of medallions, 36 in total with collectors folder. 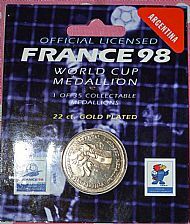 Includes the impossible to find 'France Winners' medallion. Super old board game unashamedly copied from Monopoly. Great teams, great game board. Do you have the rulesheet? Full set in folder plus a loose set of coins issued in Germany for the 1974 world cup. 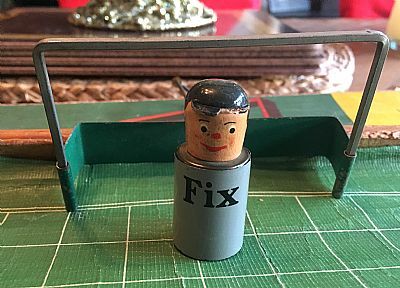 Nice tinplate spinning game from Mettoy, lovely large game. 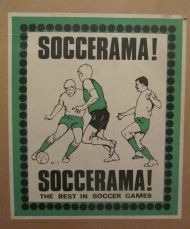 Logacta, the greatest football game ever. Found them! From Vernon No. 5 Table Soccer game. 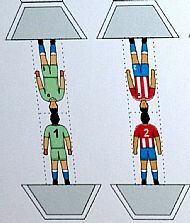 A second version of the Kika Goal game, this one has an ingenious rolled pitch design. A very rare board game by Daneham Cottage Products, full of colour and nice designs offering the usual mix of money, incident cards, player cards and dice. Well worth a look. A newly aquired little gem of a game that I had not heard of before. Great to play, nicely designed and complete with spinner! 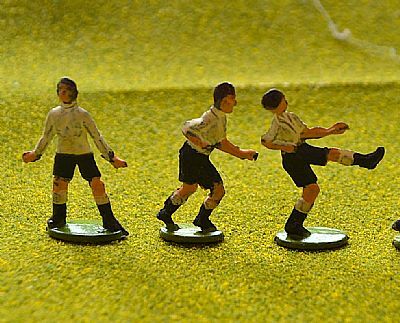 Mini-Soccer early football board game desperately wanted! 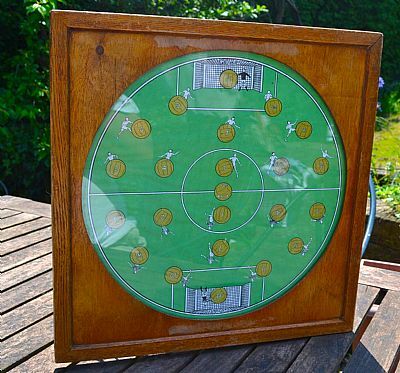 Top price paid for this superb 1950s football game with large cloth pitch. 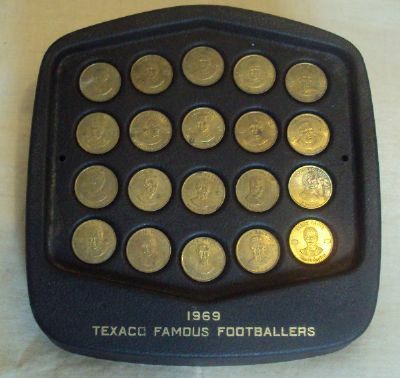 As I approach fifty different sets of collectable football coins it is time to start building my site pages to catalogue them. 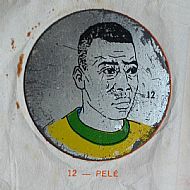 Also includes similar collectable sets that are not coins. A cross between football and chess apparently. 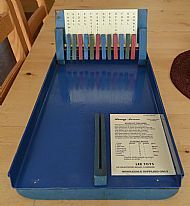 An old Swiss made board game. 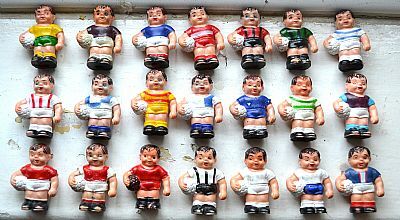 Two teams of eleven small tin footballers, do you recognise them? 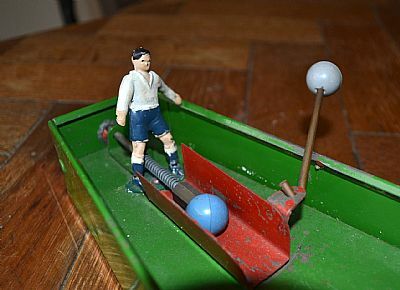 A cross between football and billiards - take a look! This 'Junior Model' is over four feet in length!! 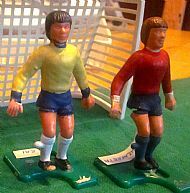 I am delighted to now have three different Socrates magnetic football sets detailed on this site. 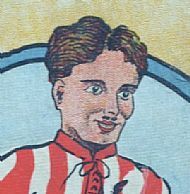 Click on the image to go to all three versions of this game. A delightfully simple metal and wood game - roll the old pennies down the shoot and add up the score of the targets you knock down. 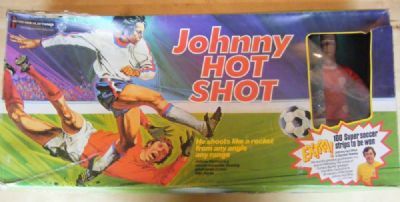 Just take a look at this superb outdoor game version of Johnny Hot Shot including wonderfully painted figures. Thank you to Paul from Liverpool for sharing his wonderful creations. A recent game from 2010 that shows just what can be achieved with some design skills and a colour printer. Fabulous looking game with dozens of colour team sheets. 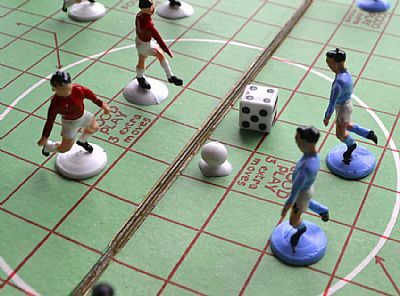 Fabulous 1950s football game that combines Subbuteo and Tidleywinks on a baize pitch. Endorsed by Sir Stanley of course. Great game, crap name! 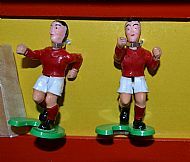 The 'starter set' for the long running Soccerette series of magnetic football games. 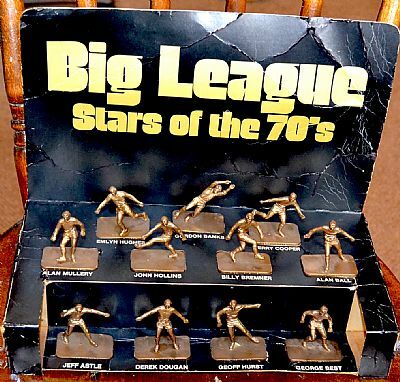 This set has a major flaw in that the pitch was made of cardboard which warps over time. A wooden magnetic game from Czechoslovakia. Extremely original and lovely figures! Highly original 1950s game by Spears that promises a lot but delivers figures that are impossible to play with! 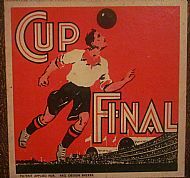 Interesting 1950s forerunner to the Striker series of games. 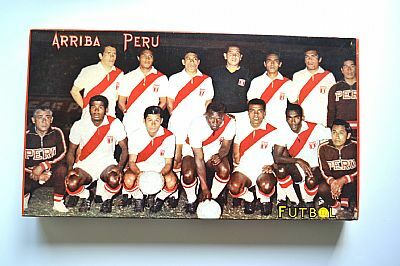 Superbly designed box and with keepers whose handles are a mechanical marvel! 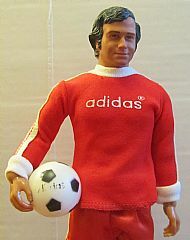 Huge and rather splendid mechanical kicking footballer by Bandai. Come and take a look by clicking on the photo. 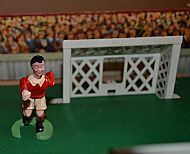 What am I doing including an egg chasing game on this footballing temple? 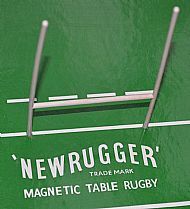 Newrugger was a short lived game made by Newfooty and comes on a double sided pitch with 'Socrates' on the other side. Click the image to find out more. 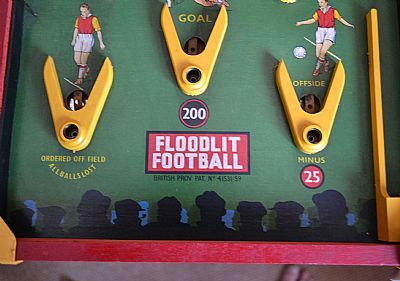 We all played this as kids but this is the original pre-production prototype of the game - complete with pen top counters! 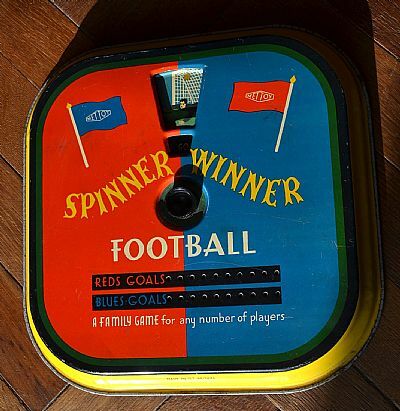 Lovely 1920's game with kicking figure and a nice target board to aim at. 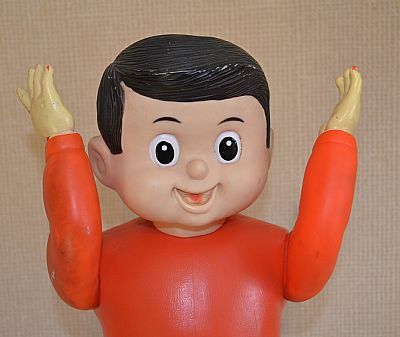 Look out for the mystery hand! The top of the range battery operated version of Kay's classic bagatelle game. This version is totally unused and sealed. FKS Soccer Stars trump cards - set 2! 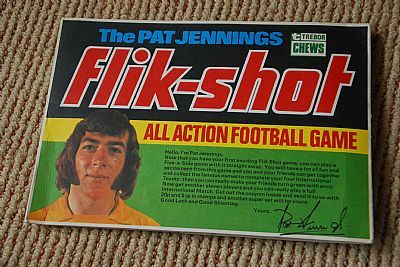 Iconic trump card set from FKS from 1977 or 78. 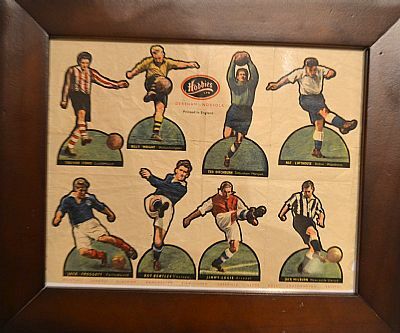 Set 1 had individual players but this one, set 2, had lovely team group photos of Europe's greatest club sides, plus a few token local teams such as Bristol City, Cardiff and Arsenal. 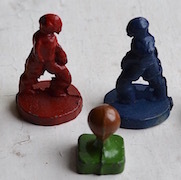 An unusual game created to showcase the classic pen top figures from the 1970s. Eight a side and incredibly rare. It's my ball and I'm going home if you don't let me win!! 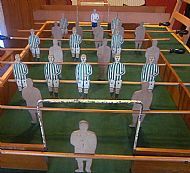 A large format wooden stadium with moulded plastic players that revolve on spindles. 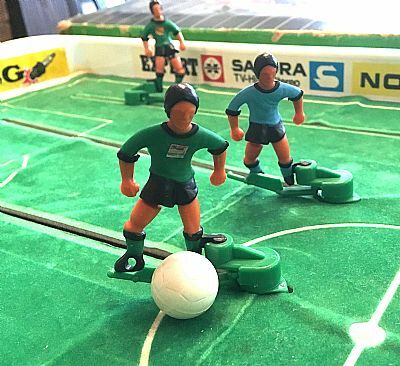 Possibly Italian, any information on this game would be most welcome. 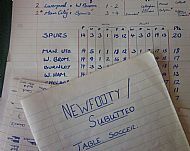 Do you have any old notebooks full of imaginery leagues and teams?